Obama's Iran Remarks Labeled Conciliatory, Naive : The Two-Way In an interview with NPR, the president left open the door to reopen the embassy in Tehran, called Iran's defense concerns "legitimate" and said it could become a "successful regional power." 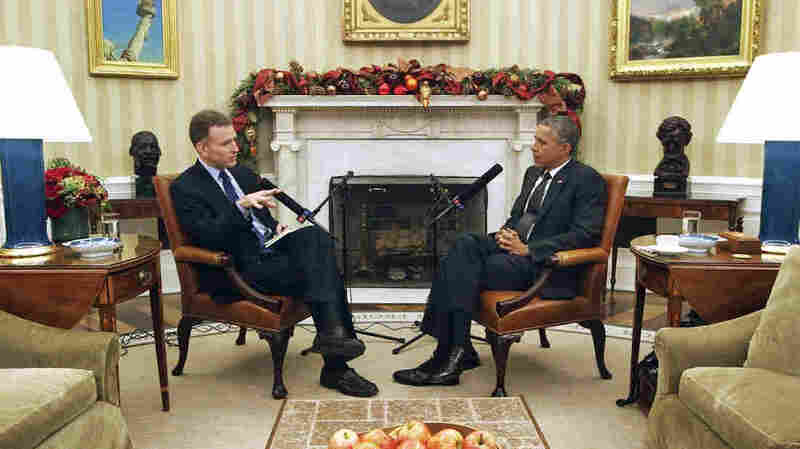 Morning Edition host Steve Inskeep interviews President Obama in the Oval Office. President Obama's remarks on Iran in an interview with NPR are being labeled "one of the most conciliatory" ever on the Islamic republic by a modern U.S. president, and excoriated as "naive." Here is some of what Obama told Steve Inskeep, host of Morning Edition, about Iran. -- On the possibility of reopening the U.S. Embassy in Tehran: "I never say never, but I think these things have to go in steps." -- On Iran's nuclear program: "[I]f you look at the negotiations as they've proceeded, what we've said to the Iranians is that we are willing to recognize your ability to develop a modest nuclear power program for your energy needs. ... They have legitimate defense concerns, but those have to be separated out from the adventurism, the support of organizations like Hezbollah, the threats they've directed towards Israel." — On Iran's possible future: "They have a path to break through that isolation and they should seize it. Because if they do, there's incredible talent and resources and sophistication ... inside of Iran, and it would be a very successful regional power that was also abiding by international norms and international rules, and that would be good for everybody." NPR's Peter Kenyon tells us that last comment by the president appears to boost optimism, but "for now it all remains a matter of atmospherics." The comments in themselves do not appear to be new, but it's phrases such as "never say never," "legitimate defense concerns" and "it would be a very successful regional power" that are getting much attention. They are seen as significant because Iran and the U.S. have not had diplomatic relations since the 1979 Islamic revolution in Iran and the subsequent hostage crisis. The U.S. regards Iran as a state sponsor of terrorism, and U.S.-led sanctions have crippled Iran's economy. A recent opening between the two countries are talks over Iran's nuclear program. Those talks, which also involve Britain, China, France, Germany and Russia, are set to resume Jan. 15, 2015, in Geneva with significant differences. Karim Sadjadpour, a senior associate at the Carnegie Endowment for International Peace, says Obama's comments to NPR "have to be one of the most conciliatory interviews on Iran that any U.S. president has given in the last 35 years." Sadjadpour told NPR's Robert Siegel in an interview Tuesday that while the president's remarks have been welcomed by the Iranian people, Obama's "rhetoric is somewhat unsettling for the hard-liners in Tehran because it becomes more difficult for them to justify their anti-Americanism." Israel, which calls Iran an "existential threat," has not officially responded to the comments. But Prime Minister Benjamin Netanyahu on Monday said what was needed "are more sanctions, and stronger sanctions" against Iran. Some domestic reaction was critical, too. John Bolton, the former U.S. ambassador to the U.N., called Obama's remarks "naive" and "dangerous." "This is a wonderful notion, the idea that the end of Iran's isolation could lead it to moderate its more extreme impulses. But there isn't much in the way of proof to suggest that Iran's rulers are looking to join an international order whose norms are defined by the United States and its allies. In fact, there is proof of something quite opposite: Iran seems as interested as ever in becoming a regional hegemon, on its own terms. And its supreme leader, and his closest confidants, have made it clear, over and over again, that he is not interested in normalizing relations with the United States."